SPEED's Uehara Takako attends stage greeting for "Koitanibashi"
SPEED's Uehara Takako attended the stage greeting at the opening day of her movie, "Koitanibashi", along with co-star Mikami Kensei and director Goto Koichi. In "Koitanibashi", Uehara portrays a young woman who returns from Tokyo to Tottori prefecture after losing her job. She then undertakes the mission of reviving her parents' inn at the Misasa Onsen (hot spring), and eventually becomes its mistress. The story was based off of "Ame no Naka no Hatsukoi First Love in the Rain", which was the winner of 2008's 'The 1st Super Scenario Grand Pix'. Uehara, who also celebrates her first starring role with this movie, commented, "Misasa is a place where can forget to bring a long a lunch box, but you better not forget your umbrella. It really did rain a lot and I often went into the onsen when I was getting cold. The filming was tough, but thanks to the Misasa Onsen it actually felt like I was getting more healthier." Further she added, "Everyone in the town helped out with the filming, which is why it became such a perfect movie." The singer/actress also revealed that her fellow SPEED members have yet to watch the movie. She said, "I think none of them have been to Misasa yet, so I'd like to go there will all of them and act like their guide. We always talk about, how we've never been on a private trip together. We only travel the country together when we are having a live tour." 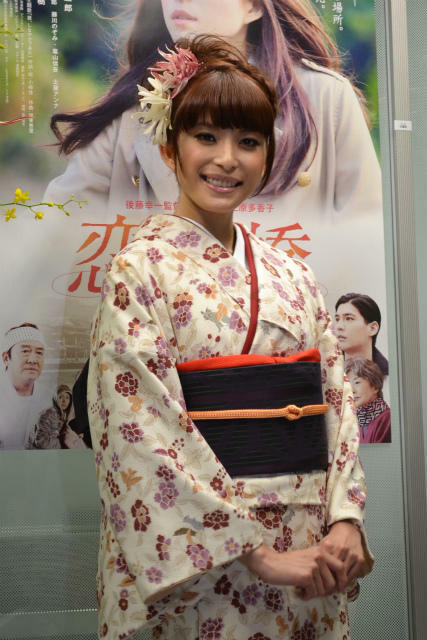 About her role as a chef in the movie, Uehara said, "In private I basically don't cook at all, but thanks to the coaching of a master chef I somehow was able to do it. The Tottori dialect was extremely difficult as well, but I've tried my best while studying the dialect of the locals." Director Goto commented, "The opening day is always exciting. It feels like our child is finally able to walk on his own. I hope this movie will be able to give a lot of people strength." Tottori's governor also attended the stage greeting and gave everyone a bunch of flowers. He said, "Ever since the Great Tohoku Earthquake, 'bonds' and 'reconstruction' have become THE keywords for this country, and that's exactly the theme of this movie."